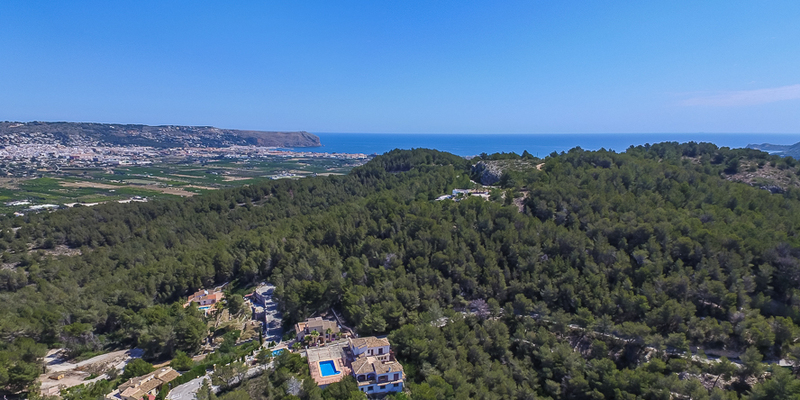 South-west facing with stunning views over the valley, Villa Rafalet is a high quality, light and airy villa offering a tranquil setting in one of the peaceful and exclusive areas of Javea. For those who need style and luxury on holiday, as well as space, this villa is immaculately presented with high-end designer furniture and fittings throughout. 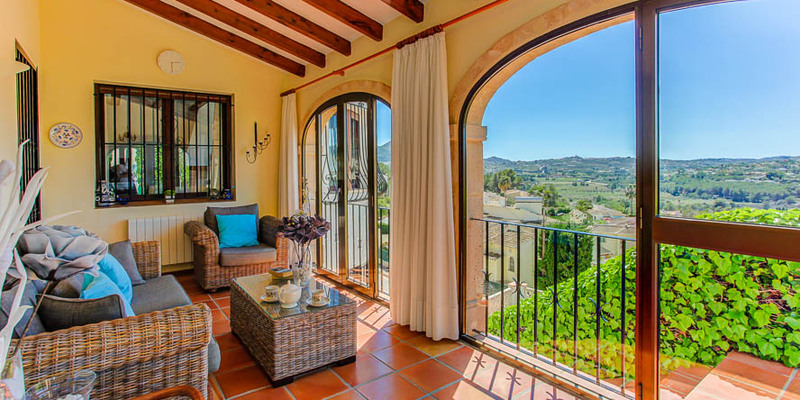 With its distinctive turret at the front, Villa Rafalet is bright and modern whilst maintaining the traditional Spanish character, boasting local Tosca arches and beamed ceilings. The huge outside area is spacious and private surrounded by very attractive terracing and luxurious potted plants. Villa Rafalet benefits from being totally enclosed and is accessed through private electric gates leading to parking for two cars. The villa is set over two floors both of which are accessible from outside. The upper level is the main living area with a large glazed naya furnished with stylish modern conservatory furniture to relax and enjoy the great views across the valley. From the naya a spacious hallway leads to the main rooms on this level.. The lounge and dining area is furnished in a very comfortable and modern style. There is a large open fireplace with a log-burner for the winter, giving a warm and cosy feeling to the whole house. The triple aspect windows in the lounge have mosquito blinds which allow you to open the windows at night to keep the house cool. The villa is equipped to provide maximum comfort and includes Satellite TV and radio, DVD player, CD player, board games and books for your use. The dining area comfortably seats 8 guests when extended if you prefer to eat inside. 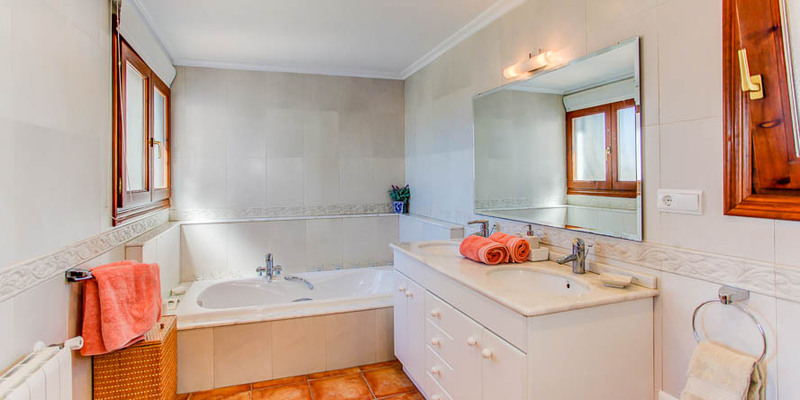 There are three double bedrooms (one en-suite) and the house bathroom on this level. The master bedroom has a king size bed, a very large white marble en-suite plus a private terrace and patio area for total relaxation. The second bedroom also has a king size bed and the third bedroom has two single beds. All bedrooms on this floor have built in wardrobes, air conditioning and mosquito nets for your comfort. The kitchen is fully equipped with a cooker, separate hob, fridge, microwave and dishwasher together with a full range of crockery and cutlery for indoor and outdoor dining. Adjoining the kitchen is a large utility room housing a washing machine and an additional fridge/freezer. From the back door, there is access to the upper and middle terraces; both provide large areas to sit, eat and drink together whilst enjoying the stunning views and sunsets across the valley. A BBQ is provided for guests who enjoy a night in and eating 'al fresco'. 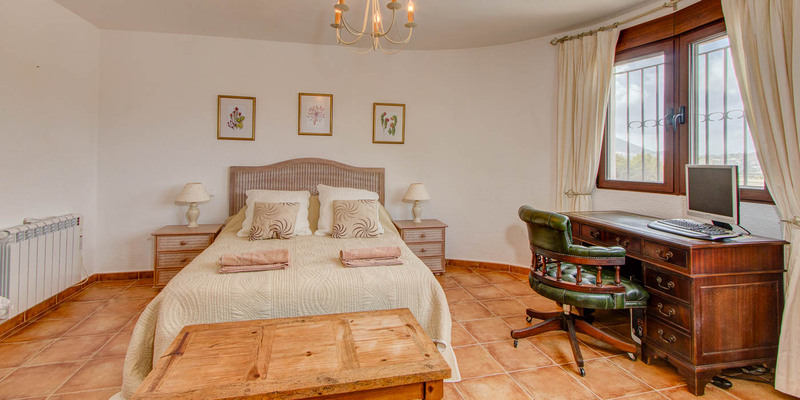 On the lower level, there is a separate large bedroom with a king size bed plus a shower room . There is also an additional large fridge/freezer in which to keep drinks and ice creams for around the pool. The villa boasts a fabulous, private 8x4 swimming pool with Roman steps. A large private terrace surrounds the pool and is furnished with many comfortable sun beds and umbrellas to provide shade if required and a table and chairs to relax around the pool. The pool area is gated for the safety of young children. 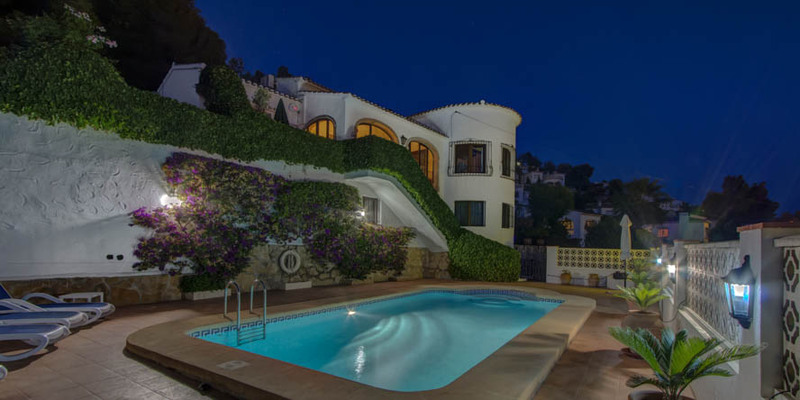 The villa is surrounded by beautiful auto-sensor external lighting which creates a wonderful ambience on an evening and the pool is also lit for late night swims. For your security the windows are double-glazed and have electric blinds in the lounge, master bedroom and downstairs apartment. All windows have iron grids for additional safety. The villa benefits from fast-speed Wi-Fi. Please note that smoking is not allowed inside the house and pets are also not allowed. 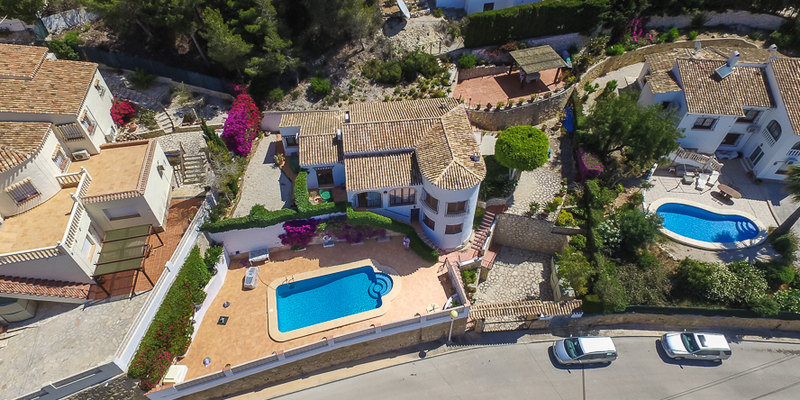 Villa Rafalet is the perfect holiday home to quality time with family and friends; whatever the age of your children - there is something for everyone in Javea. The villa is just 5 to 10 minutes’ drive away from the historic Old Town, Port and Arenal sandy beach with its bars, shops, restaurants and vibrant night life. Please note external steps may make this villa unsuitable for some clients. 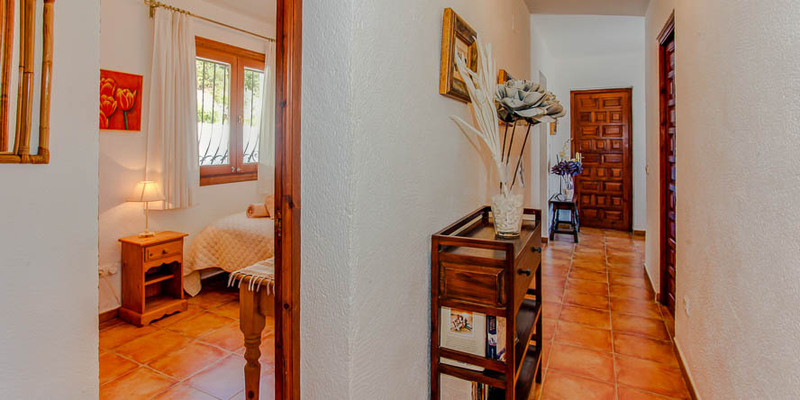 There are three bedrooms in the main villa. There is a further bedroom on the lower level which has a private bathroom and a private entrance. This bedroom has electric blinds, a fan and mosquite nets. Optional extras such as cots, high chairs, folding beds can be requested as required . Your booking is not confirmed until you receive a confirmation email from us. the best villa that i have ever stayed in by far.the location super with mount montgo in the distance, watching the sun rise and set in the valley the view from the terraces was lovely. 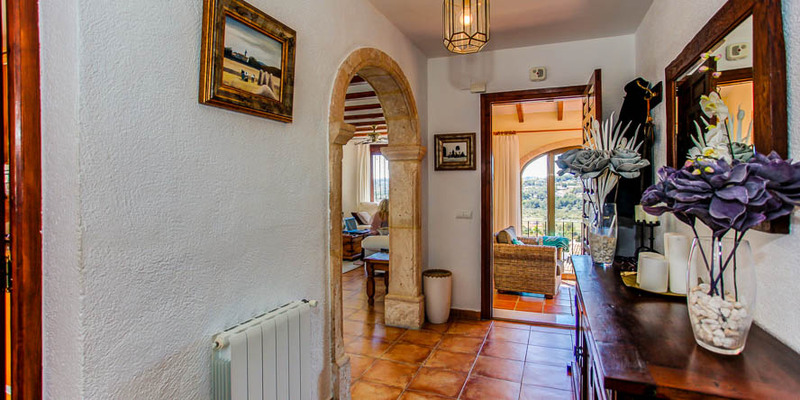 the location was far enough away from javea that it was peaceful but only a few minutes drive to the town. a good combination of restaurants and amenities. also the supermarkets petrol stations recycling area close by. the villa itself was spotless and all the rooms were airy. a nice touch was the mozzie screens and all the fans in the bedrooms and the lounge. the kitchen had everything you could possibly want to make your stay relaxing. you couldn't fault the maintenance of the villa. the pool cleaner, the Gardener the laundry service came early in the morning and sometimes had been and gone before we were up. the terraces were lovely and private you could find a bit of peace from the lovely pool if you wanted it. the best terrace was the top terrace up there with the barbecue glowing watching the sun go down over the hills with a nice chilled sangria and watching the buzzards and an eagle ride the thermals binoculars are a good idea especially in the national park. the shower room next to the pool was great also, it had a separate room with a fridge freezer in it. lots of ice cream and cold drinks and only a few steps from the poolside. 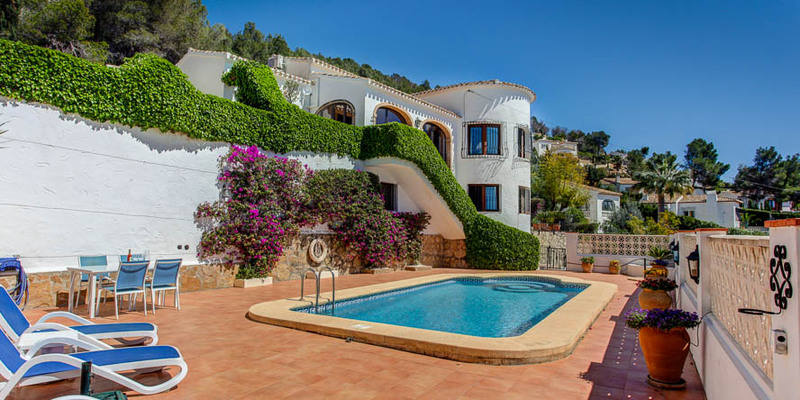 the villa had great customer service, and the visitors book had all the good restaurants and places to go, including local events in and around javea. my personal best was visiting valencia the city was full of churches museums and architecture thursdays are market days everywhere so enhanced the visit.the arenal was very popular in the evening for eating and walking along the beach with little craft stalls selling local trinkets. benidorm has an animal theme park called munduma with a great dolphin show and mist sprays as you walk around, and next door is aqua land for the more adventurous.so if your worried about activities there is so much to do from boat rides to jet ski hire horse riding go carting to name but a few, but don't take my word for it see for yourself. i hope this review helps. 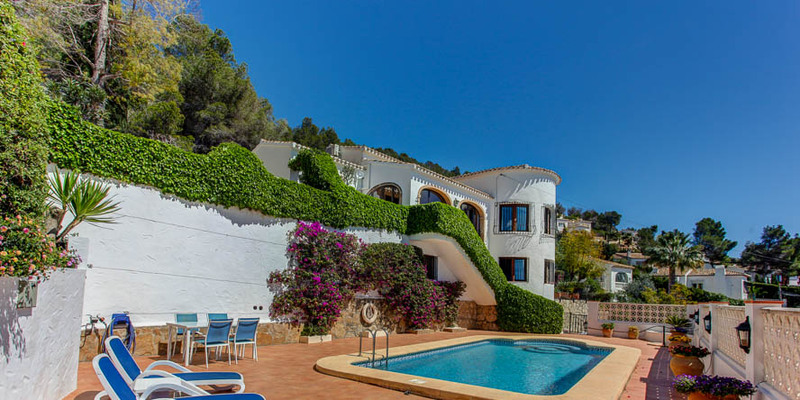 We have stayed in the Javea area seven times and this villa was by far the best that we have stayed in. My wife even suggested that it was a shame that we couldn't wrap it up and take it back to England. The upper terrace was simply magnificent for eating al fresco, having a drink or even just sitting there and watching the sun go down. Four adults have enjoyed two superb weeks in this villa and none of us can find anything significant to complain about. My husband likes to read his newspaper in the sun first thing in the morning, the sun reaches no part of the property's many seating areas til about 9 am. so that is a minor moan from him! The steps up and down to the four levels and the keys to the many doors do seem daunting at first but we soon established a routine for dealing with them. The pool fridge and bathroom was a big positive. Very young children would have to be watched and infirm would find the steps too much. The villa was exceptionally clean on arrival, a very welcome, "welcome pack" was in the fridge and a decent tv to watch wimbledon was provided. The mozzy nets at the windows and the air conditioning in the two main bedrooms were only two of the features provided in the villa where everything has been thought of. Comfortable covers for sunbeds, sun umbrellas, quality plastic glasses for use around the pool area, a bookshelf full of novels, the list is endless. The entire process has been very smooth from the first enquiry to receiving and banking the cheque repaying the damage deposit. Une très jolie villa qui tient toutes ses promesses. Très bien équipé, propre et adaptée pour une famille avec des enfants. Il y a tous ce qu'il faut !!! la pergola idéale pour prendre les repas car toujours à l'ombre et à la fraiche. Nous avons passé un très bon séjour dans cette belle maison. Les propriétaires sont sérieux et sur place la personne de contact s'occupe de tout au moindre souci. 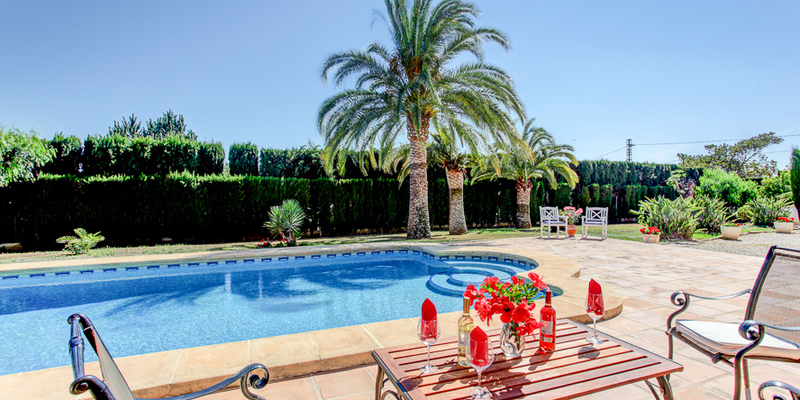 Beautiful villa and swimming pool with excellent facilities. Three different terrace areas to choose from when sitting/dining outside. Also, a cosy veranda. Fab views. Everything in the house was to a very high standard. Extremely clean and good condition. Quick drive to the lovely town and beach areas of Javea. Would definitely book to stay again. My husband and I have just enjoyed a very memorable week here with my daughter and husband and her teenage children. We enjoyed every moment and it was wonderful to have the space and privacy so 3 generations could enjoy holidaying together. The management company were very good and met us on our arrival at the villa which made moving in simple. The villa is immaculate and well laid-out with beautiful furniture and we were extremely comfortable. The pool is super and has many sunbeds, there are lots of different eating areas and the views are wonderful. We enjoyed many BBQ's on the top terrace with our grandchildren's friends and their parents and relaxed in a lovely naya when we needed a few quiet moments - plenty of room for everyone! I would definitely recommend this villa and hope to go back soon. 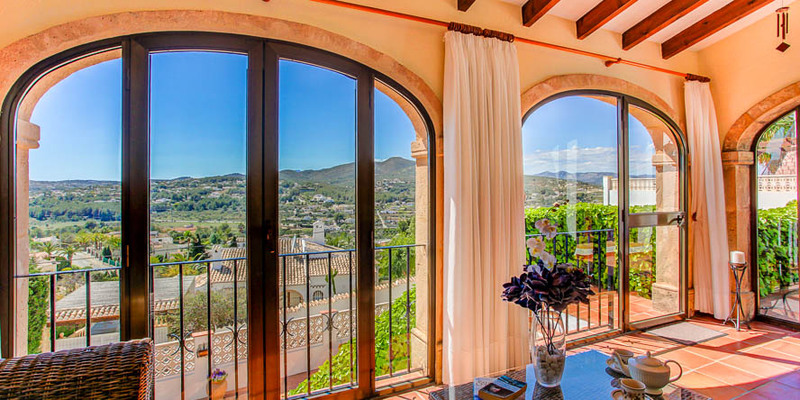 We have just returned from this excellent villa which easily surpassed our expectations. 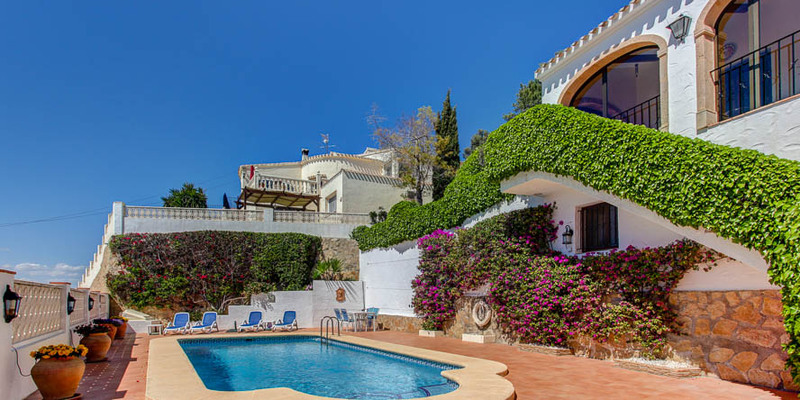 We have been staying in villas around the Javea area for ten years and this was the best villa we have had the pleasure of enjoying. The view from the terraces is amazing and there is nothing better than watching the sun set in the evening from the upper terrace whilst the barbecue warms up with a glass of cool wine. 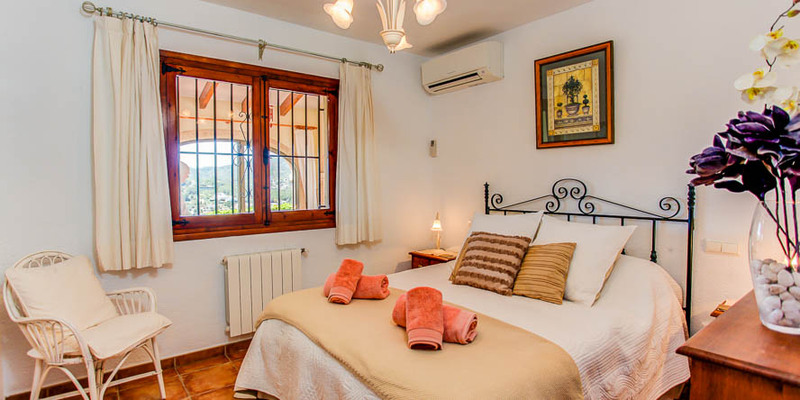 The villa easily sleeps six in air conditioned rooms with a further room at lower level with ceiling fan. The pool area is spacious and well stocked with sun beds and shades. 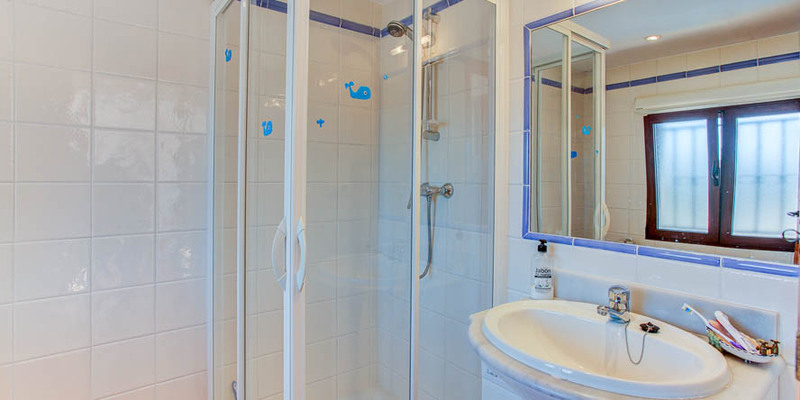 Overall it is hard to fault this well appointed property and the maintenance. It is well placed to reach the many restaurants and beaches in a short drive. We hope to be back! What a lovely villa! Spacious yet with a real homely feel. A really good sized swimming pool with sun loungers etc. Very clean on arrival. Ideally placed in a lovely area we cannot wait to re-book. Well equipped, choice of terraces, exceptional view, fabulous pool. Recommended by a friend and we were not disappointed. Well managed by agents. Have already booked for next year. 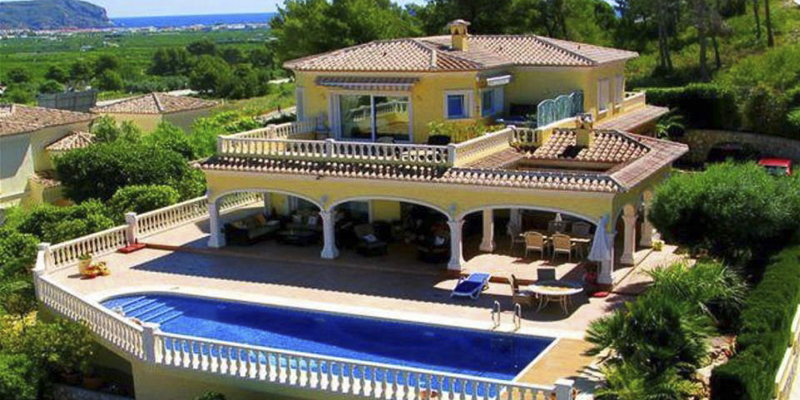 Great holiday in this glorious villa. Immaculate throughout and everything you could wish for was provided. Lovely terraces and lots of different areas to rest. The pool area is fabulous-we loved it. 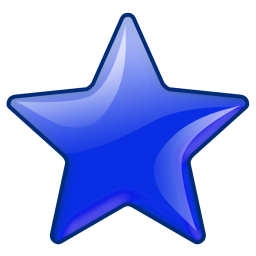 We have stayed at Villa Torreta Rafalet on a number of occasions and each visit has always been a success. 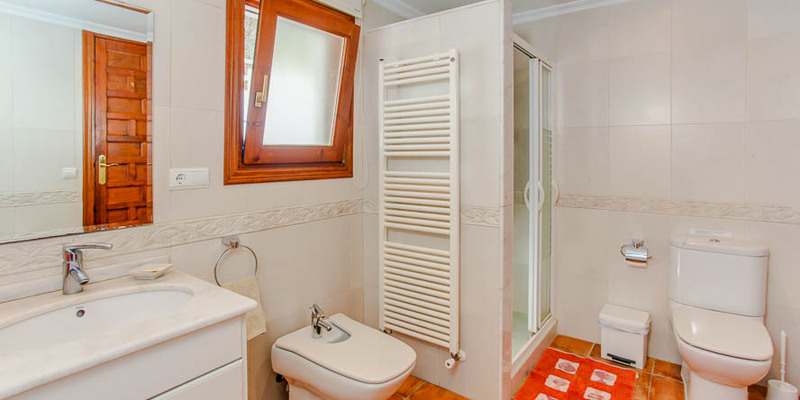 The villa is located on a very well kept urbanisation about 15 minutes drive from Javea. The villa itself is immaculately kept. We love it because it is spacious and has plenty of outdoor areas to relax in. 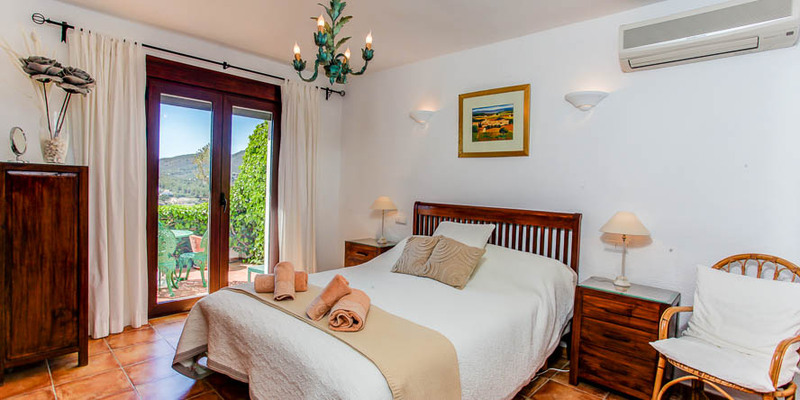 The villa is well equipped and the beds are extremely comfortable. We shall certainly be returning again.